Professor Inderjeet Parmar, head of City’s Department of International Politics, has this week appeared on American business news channel CNBC to discuss the findings of the Mueller report. Professor Parmar stressed that, while recent investigations, including the Mueller report, do have a “degree of plausibility” to them – hence why the investigations have been deep and broad – “I have never believed that [Trump] was any kind of agent colluding with the Russians”. But he doesn’t believe Mueller’s report fully exonerates President Trump. “The report’s conclusions leave open a very ambiguous position, which is probably the best place for the Democratic Party to be. [It means] they can carry on. Asked whether Mueller’s findings could lead to accusations that the Democrats are conducting a ‘witch hunt’, Professor Parmar said that attention should now turn to the House Committee on Oversight and Reform. What next for Trump’s presidential rivals? Professor Parmar was asked whether the findings of the Mueller report could damage the prospects of other presidential candidates, such as Elizabeth Warren, Bernie Sanders and Beto O’Rourke, who have been publicly damning of Donald Trump’s alleged ties with Russia. He said: “They are going to suffer the consequences of their actions. They have – largely without evidence – been accusing Trump of being, essentially, a puppet of [President of Russia Vladimir] Putin. “Trump was critical of the 'American Dream’, but a lot of people who were opponents of Trump were saying exactly the same thing. Yet they accuse him of sowing discord that aligned with the Putin agenda. Professor Parmar has been a regular commenter on the Special Counsel investigation (2017–19), also known as the Mueller report or Mueller probe, for the past two years, most notably for The Wire. With the report summary now released, Professor Parmar believes the findings pose as many questions as answers. “What are/were the political functions of the Mueller and other investigations into Trump's alleged collaboration with Russia?” he said. “Does the Mueller report really fully exonerate Trump? Or, alternatively, is there a McCarthyite nature to the investigation of Trump? Professor Parmar says it was clear to many observers (himself included) – whose voices were “drowned out in the media din” about Russian interference – that there was little if any hard evidence to back up the claims against Donald Trump. “The dispute is really within the national security establishment over whether or not Trump can be relied upon to deal with growing domestic discontent and increased global challenges to US power,” he said. 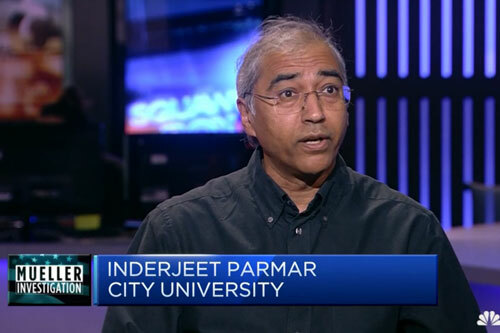 Watch the video of Professor Inderjeet Parmar discussing the Mueller report on CNBC. Professor Parmar is co-editor of a book series, Routledge Studies in US Foreign Policy. He was a member of the Working Group on Think Tanks of the Social Science Research Council, New York, 2007, and co-convenor of the BISA Working Group on US Foreign Policy, 2005-9. He is often asked to appear on mainstream media outlets, including CNN, BBC and Al Jazeera. He regularly tweets his commentary on breaking news stories at @USEmpire.